Kazuyo Tsuchiya received her M.A.s at the University of Tokyo and University of California, San Diego. She received her Ph.D. in history from the University of California, San Diego in 2008. Her book, Reinventing Citizenship: Black Los Angeles, Korean Kawasaki, and Community Participation, which appeared in 2014, compares welfare activism of African Americans in Los Angeles and Resident Koreans in Kawasaki city, Japan. 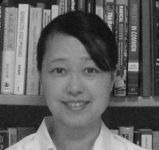 She has published several articles on postwar black Los Angeles, the "War on Poverty," and the welfare rights movement in the U.S. She is now an associate professor of American history in the Department of Area Studies, Graduate School of Arts and Sciences, University of Tokyo. ?